NovaBond LSE bonding tapes create a strong bond on low surface energy materials. 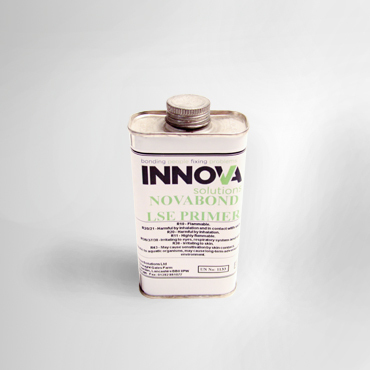 NovaBond LSE Primer makes that bond stronger still. Low surface energy materials (eg powder coat paint) traditionally resist bonding adhesives. LSE bonding tapes and adhesives create an effective bond where other adhesives can’t – and using an LSE primer can improve that bond by up to 50%*. NovaBond LSE Primer is ready to use, can be applied by brushing, wiping, spraying or dipping, and can be air dry in 5 – 10 minutes, depending on atmospheric conditions. Improve the integrity of your finished product. Choose Novabond low surface energy primer. For non-low surface energy surfaces use NovaBond Surface Primer. For priming glass use NovaBond Glass Primer. Remove dirt, dust, excessive grease, oils or other contaminants with NovaBond Surface Cleaner, or wash with detergent and water, then rinse. Wipe, brush, dip or spray the primer onto the surface(s) you intend to bond. Primer should be air dry in 5 – 10 minutes with good air flow, or use an oven at 93°C – 121°C (200°F – 250°F) for 2 – 4 minutes. Please note: The above guidance does not constitute a Material Safety Data Sheet (MSDS). For handling, storage, composition, disposal and safety information, please ask us for an MSDS when you order the product. Before using the primer please ensure you have read and fully understood the NovaBond LSE Primer MSDS.